This month marks the one-year anniversary of the launch of the SunPower® Helix™ solar system, the world’s first fully integrated solar solution designed for businesses and public agencies with the goal of making the complex simple. A plug-and-play power station with factory installed connectors, which eliminates wiring and the need for tools on site, reducing labor costs during installation and improving reliability. SunPower® EnergyLink™ software, a comprehensive, intelligence software for solar which provides usage data to identify savings opportunities. It is also distinguished by being fast to install and adaptable to the available space — rooftop, solar carports or ground — to best meet an organization’s energy goals. After its first year in the market, we’re proud to say that the Helix system has won an award, too. Innovation, aesthetics, performance and value were the criteria under which the Helix system was named a winner in The Architect’s Newspaper’s “2016 Best of Products Awards.” The Helix system won in the category of HVAC and Smart Building Systems. Entries were evaluated by a jury of design professionals and editors. Macy’s saw value when it shopped for solar and purchased Helix systems. In partnership with SunPower for a decade, the retailer has long been an advocate of clean, renewable energy. Macy’s has SunPower solar on 71 Macy’s and Bloomingdale’s locations, including 19 Helix rooftop systems that were added this year. Toyota's new North American headquarters in Plano, Texas, will feature Helix carports when it opens in 2017. Expected to generate 25 percent of the headquarters' total electricity demand, the system is anticipated to be the largest corporate office on-site solar installation among non-utility companies in Texas. Helix systems get high marks from Kern High School District (HSD) in Kern County, Calif., which made the largest commitment to solar of any school district in the U.S. when it partnered with SunPower to build 22 megawatts of solar power systems at 27 district sites. Under the contract, SunPower is installing several Helix carport systems, a smart use of space in otherwise underutilized parking areas. Solar for schools plus storage will maximize savings for Colton Joint Unified School District in California’s San Bernardino County through the use of battery storage provided by SunPower. Included with Helix systems at seven schools, this powerful combination of solar and storage will reduce peak demand charges and increase the district’s energy savings an estimated 54 percent more than with solar alone. Higher education is learning the advantages of Helix systems. 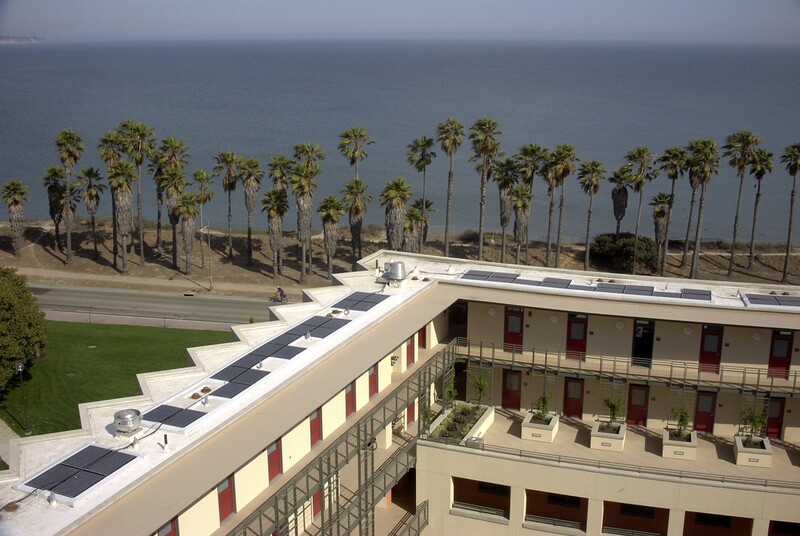 SunPower is installing solar power systems at five sites on the campus of the University of California, Santa Barbara, including four solar parking canopies and a Helix rooftop system on the gym. This will provide around 13 percent of the campus’s annual electricity use, and a third of its peak electrical demand. Cal State Fullerton and Cal State Long Beach are also installing Helix systems. Businesses and public agencies can contact SunPower directly about Helix systems, or they can contact one of our locally operated SunPower commercial dealers. SunPower and SunPower dealer representatives will both be knowledgeable of the product, as well as of the solar financing options, such as power purchase agreements (PPAs). PPAs may be an easy way to reduce electricity costs and achieve a hedge against rising utility rates, with no upfront capital investment. 2SunPower 327W compared to a Conventional Panel (250W, 15.3% efficient, approx. 1.6 m2), 8% more energy per watt, 0.75%/yr slower degradation. BEW/DNV Eng. “SunPower Yield Report,” 2013. Campeau, Z. et al. “SunPower Module Degradation Rate,” SunPower white paper, 2013. 3 SunPower 327W panel with Helix DT compared to standard efficiency Conventional 260W panel and flat roof mounting system.